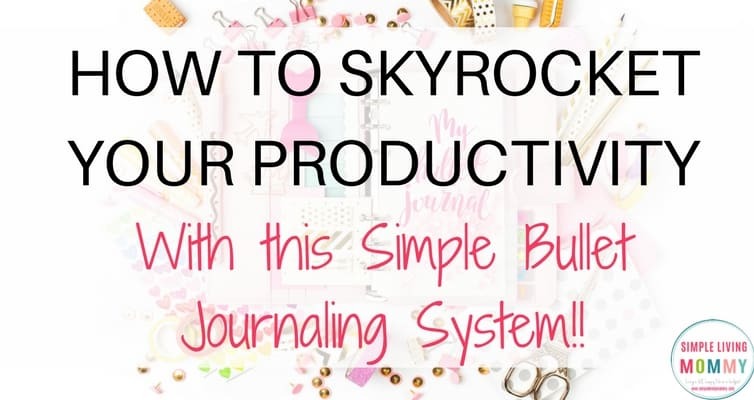 Simple Bullet Journaling That Will Skyrocket Your Productivity! If you have researched planners lately or have perused Pinterest for more than five minutes, chances are, you’ve heard of a Bullet Journal. You can read about the basics of Bullet Journals here – which I am all for. People have somehow taken these to this extreme with drawings and graphics and colors. This is the new fad these days and they’re becoming incredibly popular. There are Bullet Journal how-tos on YouTube, blogs dedicated to them, the list goes on and on. 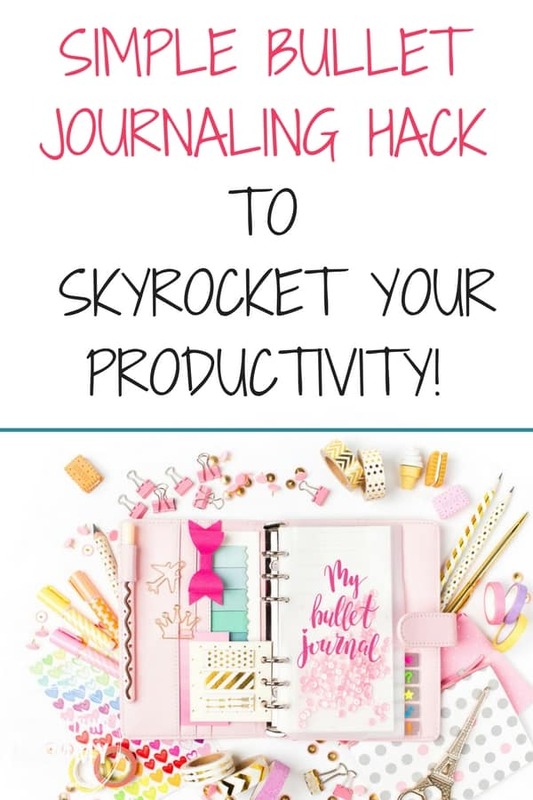 I believe simple bullet journaling can actually skyrocket your productivity AND break the cycle of abandoned planners! Trouble getting and STAYING organized?? Check out these awesome and CHEAP resources to get you on track once and for all! However, if you’re like me, you buy a planner with the best of intentions only to use it for a day and then stop. Then somehow, I always get tempted to buy another one (and another and another) because I’m convinced a new design will somehow make me more accountable and more likely to use it. After one glance at a blinged-out Bullet Journal, I knew mine would suffer the same fate as all of my other poor planners that are sitting in a tote somewhere wondering what the hell went wrong. Don’t get me wrong, Bullet Journals are amazing tools if you’re dedicated enough to use them. You can make lists of just about anything…books you want to read, things you need to buy, meal plans, etc. The problem is, the simplicity of the Bullet Journal is getting so lost in all of these graphics and colors. It is way too time consuming for me. Yes, you can make one from a simple tablet and not waste the money on a planner, but most of the Bullet Journals I’ve seen go way overboard. There are hand-drawn banners and fancy handwritten fonts, colored pencils get involved – it scares me. If you DO decide to make an artistic bullet journal, at least start with cheap bullet journal supplies in case you change your mind. What works for me has been this incredibly simple system a coworker showed me a few years ago. This is basically a bare-bones daily Bullet Journal with daily “migration” instead of monthly, as is recommended in the original Bullet Journal video. My much simpler version of the crazy bullet journals you’ll find on Pinterest doesn’t involve a key or modules or monthly migration. I simply use a regular day planner, but have used a plain tablet (my current favorite) with equal success. This is probably closer to what the original developer of the bullet journal intended. There are no illustrations or drawings in the original bullet journal instruction video which you can find here. I simply make a list on today’s block of everything I want to get done. That might be doing dishes, running an errand, calling a utility company. I even list things that I know don’t stand a prayer of happening today. I list as many things as I need to in order to get my whole to-do list down in one main list. Then, as the day goes on, I check off everything I’ve accomplished. At the end of the day, anything that hasn’t been done gets an arrow next to it and highlighted. I guess this is my version of migrating the task. I then write that same to-do list entry on the next day. See how the task that I didn’t get done the day before is at the top of my list for the next day? You’re basically rewriting your to-do list every day. This keeps everything right in front of you so you have in your mind what you need to do. It eliminates the possibility of forgetting to do something because you’re literally rewriting that task every single day until you finally get it done. I actually end up getting annoyed that I’m rewriting this task for the tenth time and finally make it a priority to get it done. In the Bullet Journal system, you would go back through your daily log at the end of the month and rewrite all items with a task symbol that you didn’t get done that month in your new month’s list. My problem with this (and the beauty of a Bullet Journal is that you can tweak it to fit your needs, so this isn’t necessarily a deal breaker) is that you’re potentially letting a task go undone for a whole month before relisting it. That would make it really easy for me to completely forget about that task for a month. I can’t think of anything on my to-do list that could go a whole month without repercussions. If I don’t pay that electric bill, handle those taxes, do the dishes… Things can really fall apart in one month! The main difference between the system I use and the Bullet Journal system is that I’m rewriting things everyday instead of making a list of daily entries throughout the month and going back to reevaluate them on the first day of the following month. I also don’t list events like birthdays since I use a planner and can write those ahead of time anyway. Plus, with Facebook and my phone’s calendar, I honestly don’t have a need to remember a birthday in my handwritten planner. If you do, you can absolutely incorporate that into your planner. I now use a plain tablet as my simple planner instead of a planner with blocks for each day. This works even better for me. This one just makes my soul happy, I swear. I can’t get enough of that Moroccan print these days. That’s it! So by making a simple list of goals every day, moving the incomplete ones to the next day (my version of “migrating”), and checking things off as I go, a simple to-do list in a planner is my much simpler version of a Bullet Journal. Related: Check out these Bujo Monthly Spreads! Do you use a Bullet Journal? 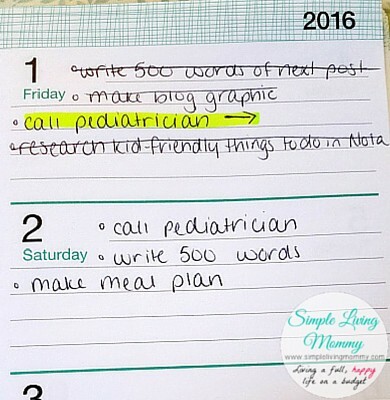 Have you tried multiple planners and failed to stick with them like I have? 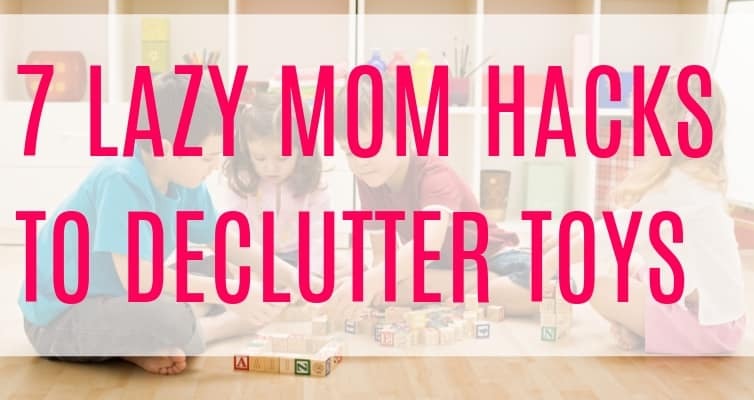 What did you finally do to get organized? Let me know what works for you in the comments! I would say that I do something between you and the really fancy bullet journals. I love to make daily to do lists that I check off, but I also love the beauty of big lists like summer goals, craft projects, vacation budget, etc. Having them all in one journal with an index page so I know where they’re at. I don’t do all the fancy things you see being done with bullet journals. I’m just not that artistic or have that much time. Omg me either! I really admire what people do with those things, but it’s almost a hobby like scrapbooking. I’d love to scrapbook, but who has the time?! Tried the Bullet Journal and it worked for a while; I seemed to be getting stuff done. But I’ve been doing something similar to your method for eons, just not as colorful. But I like the simplicity of your method. So much going on with planters now, getting overwhelmed. I like the bullet journal concept, I just don’t have the time. I understand it can be simplified, but then it doesn’t look like a bullet journal anymore and I feel like I’m better off with my really simple version. As long as it helps me manage my time and get things done – it’s a win in my book! I do use the bullet journal concept, however it is not a creative journal, I wish I had a creative gene, but don’t. The most creative thing that happens, sometimes, is the name of the month, days and dates are a different color each month. I do love making my own planner, I can adjust the spacing as needed. My to-do list has squares to color as I finish, I love doing that, and the parts of my life are color coded. I have evolved my own a coding system within the boxes, something simple and I rewrite things not completed when I turn the page. I carry a separate hourly planner for work so no appointments are in my journal. Like you, birthdays and other important things needing reminders are in my phone. The journal is the most consistent thing I have used, easily adjustable for me as I change, that I have come across. Thanks, Elsie! I like your idea about keeping a small journal for your lists. I also had lists everywhere until I found a system that worked for me. I honestly think just getting your thoughts down on paper is the most therapeutic part of list-making. I use Wunderlist on my phone for quick notes on the go and it’s been a lifesaver! so just wanted to say, I don’t think you’re supposed to wait a whole month before migrating tasks, you can do it anytime in the bullet journal system, most people see their daily entry from the previous day and, doing what your talking about, migrate the undone tasks to the current day or another day that would work better, so you really ARE bullet journaling, you are just cutting out EVERYTHING but dailies, the system is designed for you to tween it to fit your needs, apparently dailies are all you need! There are a lot of crazy intricate bullet journals out there but the original system was designed very simplistically, you should watch the original bullet journal video from Ryder Carroll if you haven’t yet, you may really like the original, I personally have a very minimalist bujo but I would have a hard time not having a cohesive future planning system. Hi Sharon, I’m really happy bullet journaling works for you. I need to watch the video again, but I have watched it a few times. I really struggled to see how I could make most of that work for me – but that’s just me. I think you’re right and I’m just the kind of person who needs the dailies. Thanks for commenting! I’ve found bullet journals to be a habit I stick with because it helps me keep track of things I need to do—but also because I ENJOY it. It’s a hobby for me and a low stakes way for me to be creative. I also use it as a mini-journal. So far, that’s worked for me! I see a difference between your version and other bullet journals. It is the same difference I see between a budget and a list of bills to pay. One version sets goals to achieve and the related tasks to meet those goals. The other is a list of To Dos. To me they are separate things. Your version seems like the To Do list. There’s a place for both. Sometimes people have a need to set goals for their life, not just the day. A bullet Journal is a way to help keep some focused on life goals. One is short term and the other long term. I find most the pinterest and you tube tutorials are just silly. They are all about having the coolest bujo rather than the actual point of a bujo. I would suggest to anyone starting out to go directly to the creators website bulletjournal.com as in his video he doesn’t have any artwork it is purely a task log like you have said except he does use migration keys. I agree with you waiting until the end of the month to migrate is silly, he doesn’t say in the video to reschedule open tasks daily but I wonder if he has just assumed people will do that anyway. I also don’t use the migration arrows, I cross out and reschedule as needed. I like the idea of the highlighter you have used as that really does show what is being procrastinated. I’ll admit I don’t journal daily, I do several times a week though and that increases depending on my schedule. I do have fancy pages but it’s not for showing off it’s just because I am arty and it gives me a reason to spend some me time doing something arty, each to there own on that one I think. Previously I have been a one page wonder with organizers but bujo has been working for me so far. I don’t think I would be able to transfer the concept to a digital version myself but I can see how it would work for others. From what I can tell your style is actually more true to the creators vision than these crazy smash journal/bujo/art journal hybrids we all see. As for migration, I do it way more than once a month. I also got rid of my monthly spreads because frankly it does not serve me at all. My daily logs go for however long they go for. Usually they’re less than half a page though. I migrate every time I turn to a new page and can’t see my old page anymore. This way I don’t need to flip all the time. That’s it. As for artsy and so many people feeling inadequate because they’re not… Yeah that’s slightly irritating. I need my bujo to be my workhorse and the emphasis of the bujo community on having the coolest bujo really irks me. people who really could benefit from the system are being intimidated away by artsy bujo blogs and others are spending their time on BuJo groups lamenting the lack of prettiness of their own BuJo and having anxiety when they write one letter wrong. It’s a tool. Don’t sweat it. And if it doesn’t serve you discard it. If it makes you more anxious (than life already does) either find a way around it or decide it’s counterproductive and drop the system. Don’t get anxious about your tool. That’s a failed tool that makes your life harder. This is not Miss World BuJo and the point is not to impress people. I think it’s just self care for some people. It’s such a great outlet for me. Just as someone might sew, write, or run, somepeiple need a creative outlet. I love that I can do a little sketching while planning my week. It feels both creative and productive. That being said, in glad you found what works for you! I love how different people are. Thanks for the post! I think I’ll incorporate the highlighting in my bujo. Hi Maxxie, when my coworker first showed me her system, she used a simple notebook too. I honestly think that would work better for me now that my schedule has gotten more hectic. Cheaper, more customizable, what’s not to like 🙂 I’ll probably go back to a plain notebook next year when it’s time for a new planner. Thanks for commenting! wow! I found this by pure accident and so glad I did! It reminded me of what I used to do years ago (before I knew anything about bullet journals!) thanks for this! I feel the same as you inasmuch as people making their planner/journal an artistic hobby – I ain’t got time for that! I journal much more like you, but I highlight important things that didn’t get done from the previous day and only migrate those tasks to a new day when I turn to a new page. That way I don’t have to write the same things each day. Also, there are a few things that I want to do every day, like take my vitamins (2x/day), drink 4 glasses of water, etc., so at the top of each new day I make the appropriate number of boxes next to the words VIT and WATER, or anything else I need to do and put an X in the boxes I succeeded in doing that day. That has really kept me accountable daily! I try to have 4 things at my hand at all time. Lip balm, planner, pen, and water. If you need flavor to motivate you to drink water, you can get MiO drops and add a little bit. Yes! Simple, dignified, and no time consuming art! This is how I use my bare bones bujo. Although I do add goal for week and uplifting motivational quote. Usually something from either readings or video of the day. Hi Lisa – ooo I really like the idea of a motivational quote! Try going to http://www.bulletjournal.com and actually watch the video. All those super crafty things masquerading as a bullet journal aren’t actually bullet journals. You’re reinventing the wheel, only you’re buying a dated planner to do it. I stick fairly close to the original concept, and I have to say my to do list would never fit in such tiny spaces. I like the original concept because it can be done in a 50 cent notebook if necessary and still be just as functional. I migrate daily, too, but I don’t rewrite unless I move on to the next pair of pages. I can see that it’s not checked off pretty easily. Hi Kimberly, I’ve actually watched the video a few times trying to figure out where those crazy crafty things came from! I really do love the basic premise of a Bullet Journal as they were originally intended and I should give credit to that. I think my issue with these crafty Bullet Journals is my complete lack of craftiness 🙂 Thanks for your comment! I use a steno pad for my BuJo. I do the monthly page, but do not do the weekly page. I do each day at as it arrives. Since I am retired, I don’t have a huge amount of tasks. If the day before is on the same page. And I did not get a task done I do not move it. As long as I can see it and see that it isn’t done, I don’t waste space. No fancy drawings just what works for me at the moment. If I hace to contact a company, I make notes under the day I called. I may transfer those notes to something I can file, but the originals are still available. I just started keeping a bullet journal in July and quickly took to heart the “make it yours” advice. If I feel like doing a fancy drawing I do, but for the most part, I divide each 2-page spread into 8 boxes and use one per day of the week and the 8th for any other lists. Each of the boxes has a banner announcing the day or week and date, and I like to color those in each day. But I don’t have to. Then I list the things that I need to do that day, as you do. I refer to my journal lots throughout the day and mark tasks off as I do them. I add pleasant things, like “”lunch with Friend,” and use a circle instead of a dot to mark it as something fun I just want to remember later. At the end of the day I migrate tasks or cross them off as irrelevant. That’s about it. My fancy chore chart and meal-planning guide I set up when I first set up the journal? Never use ’em! Haha I wouldn’t use them either! I’m really happy for people with the fancy BuJos that actually work for them. Me – never gonna happen. Thank you! I have set up my bullet journal in the “appropriate” journal and have a few collections but my day to day use is this mixed with a journal entry for that date. Very minimalist in presentation but very effective for me! I also have a simple composition notebook I use for work. There are pages for projects and notes from important meetings but it has the same approach minus the journal entry. I am not artistic so cursive lettering on my headers and some color coding on the calendar are about as decorated as it gets for me! You have captured the essence of bujo perfectly. As a backlash to all the fancy “bujo artists” out there, there is a facebook group of minimalist bullet journalists. Kudos for this post and for finding your own way. This is what Ryder Carrol had in mind when he proppsed this fantastic system. And he admittedly stole parts of it too. Thanks Jay – I’m glad you found your way here! Thank you! I am kinda torn between the two ideas, and I use a basic notebook ‘sidekick’ for the basic daily to do list and brain dump and a larger journal for laying out my thoughts, keeping my major goals and projects in one place and trying my hand at being creative with my lettering etc when I have time…i find it calming. The other fb group is lovely but overwhelming sometimes. I Love that you use a planner and still adapt it for your needs. I love all different types of planners and really miss “daytimers” and the need for them… but that is really dating myself. So I use a weekly planner that has removable pages so I can add and subtract what I need and don’t need… the thing I have struggled with is my to do list and you have tackled that for me… going to give it a try. Well, consider me “dated,” too. I used my planner religiously until a year or two ago, when it just got to be too much of a hassle to carry around. And I designed most of my own pages for non-date-specific things. Now I use my phone for a calendar because it’s not so bulky to carry around. 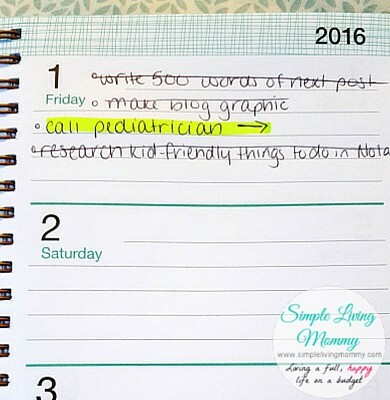 But I’m ready to go back to my planner, just so I have a place to write my thoughts, my lists … and so I don’t forget to look at my phone and end up missing my kids’ doctors appointments! I tried the Bullet Journal that the Bullet Journal site recommends but came to the conclusion that my Day Timer (which I have been using for decades) works better for me. I use two pages per day & it gives me space for my menus, inspiration quotes, chores, appointments, notes on my personal studies, etc. I have room to record my weight loss and exercise, which is one of the most important things in it. I cannot lie to myself if I have to record it. I am a little bit creative, but only in my needle craft. This also gives me a place to record the items I make for the grandkids Hope Chests (boys as well as girls), for Christmas, birthdays, etc. Hi Nola, I’m happy you found something that works for you! I have to record my weight too or I would let it get out of control. You have way more creativity than I do! Hi there. I found you on Pinterest looking for exactly this, a simple “bullet journal” / “planner”. I am very creative, but I find the creative process of putting together the ones we see takes the purpose away from what I really need it for. I would end up being stressed out about it not being right or not finding the time or money to accomplish the best “bullet journal” / “planner”. I just need a place to write down my to-dos and ideas of projects. I really like the looks of the decorative ones, they are pretty, but won’t work for me. I like the idea of highlighting the tasks not yet done. I also think a notebook or something like that would be great. Right now I have a small desktop calendar by the phone with space to write a list next to each day and a large empty spot to write notes. But I need a bigger one or a notebook so I can keep a running to-do list and a place to write project ideas, plus I am really bad at remembering, well just about everything these days. so a place to keep track of even the little things. I hardly ever comment on blog posts, but I feel so passionate about planners. lol. I have always used a monthly planner and I keep them! I have a sophomore and a senior in high school and it’s fun to go back and see that on Sept. 6, 2004 we had so and so’s birthday party or that we had to pick this up at the store.. it’s like a very personal time capsule that hardly takes up any room. Anyway – I was using the little columns to the right of the monthly calendar to do my to do lists, but I never remembered to open my planner to look at them. So then I started using index cards – small, portable.. but the problem was I was constantly jotting something down and then losing track of it, and I ended up with index cards everywhere. I ordered a grid bullet journal hoping I could get into it as I love looking at them, but I had the same problem as with the monthly planner – you have to OPEN it to look at it. Just not going to happen. So after months of experimenting, I think I have my solution! I still use my monthly planner to plan ahead, a week or a month or 6 months in advance, because you need to! And those I will continue to keep. But I need a daily of some sort. So I ripped a page out of my bullet journal, I wrote the date on top, then I write where I will be and where each of my kids will be that day and at what times and they each get highlighted their own special color. Below that is my to-do list. Below that is my “Thought Drop” for random thoughts throughout the day as they pop into my head. And below that, a tiny 8 grid graph – am meds, 6 glasses of water, and pm meds. Below that is a 4 square grid graph, each box marked M, R, Z, P. The 4 things I HAVE to do each day for myself to feel centered – Music, Reading, Zen (this is a reminder to be mindful or to meditate) and Plan – get my daily ready for the next day. This gets clipped to a small clipboard (6×9 maybe?) and I just have it lying on my desk all day where I can see it all day and it’s all on my radar ALL day. None of it is fancy – it’s all very utilitarian. But I think it’s gorgeous because my one flourish is that I put a piece of washi tape across the top of the paper. With birds or flowers or whatever.. and it gives it just enough color and warmth that it makes me really really happy. And I just bring that clipboard and my monthly planner with me in my bag wherever I go. So far, it seems perfect! Oh! And I almost forgot – The lists we all need to make and the longterm planning that goes beyond the last month of the planner — there are usually several pages at the end of the monthly planner for notes and that is the perfect place to do those and keep them all in one place! I sit in between this method and the fancy bujos… I would never send you hate mail though. Thank you for sharing!!! Refreshing! Guilt over BoJo removed! I wish Pinterest would put a max qty to the BoJo pins I have to see. I tried those BoJo layouts, but in the end, they are too removed from the original (now trademarked) BoJo concept and, most importantly, they do not pass muster at a conference room table in a business setting. I tried (as I am a bit creative) and I got too many raised brows. This is how I do mine in a Plum Paper planner! Simple and effective. One addition that I add to each daily block in the lower right hand corner is the high temp for that day and a small graphic of either sunshine, a cloud, or a cloud with raindrops. I do this on Sundays…mostly because I check the weather every night before I go to sleep (weird I know) and by doing this, I don’t feel compelled to check it nightly. Thanks for the highlighting tip for things that I don’t get done, that’s rare for me but on the occasion that it happens I’m going to incorporate this! Love the elegance of this. Thanks, I am now also ‘stealing’ this. I do this but on a weekly basis – I tried the colours and banners and stuff, found it too fiddly, but just don’t need a daily to do list. Weekly works great and I use a page a week to list agenda dates and then have a running to do list. I migrate weekly. I have one monthly work list and a monthly personal/home list and I choose from that every week until things get done. I love my way and am not ashamed to have it simple. Tried many different layouts and ways but always come back to what works for me. Hi Jamie, Great ideas. I felt as if I were reading about my life with journals and planners. Mine is similar to yours but I do add a little bit of color. Ignore comments. We have to do what works for us. Well said! I actually like having a month overview but I use a very simplistic version of bullet journal too. No banners etc. I simply don’t have the time and have a theory that people who do aren’t that busy. I really like your suggestion, it’s a definite must try for me. I can see how rewriting a task would get me moving on it too. After studying the bullet journal ideas on Pinterest, I recently bought a 6″x8″ 5-subject notebook with plastic pages and tabs for dividers. The first section I use for my “to-do” lists and I make them on a weekly basis. Outside of work (I teach music), I don’t have that much time or energy for a large daily list and I like having a full page to write everything I would like to get done though know I won’t accomplish all. I also have a section for health/wellness where I log my weight, blood pressure, blood sugars (type 2 diabetic), my fluid intake, exercise, etc. I have a section for “10-minute” and “20-minute” tasks like filing bills and papers and balancing my checkbook. I nice reminder for when I have a few minutes but not enough for a big job. I also have a page where I jot down things I don’t want to forget – movies to watch, for example. And I have a long-range plan section where I list major projects for each room in my house, the yard/garden, garage, etc. I don’t bother with fancy fonts or graphics. I just don’t have the time, energy, or creativity for that. I do plan to glue in some envelopes for things I want to keep nearby. I’m pretty simplistic myself and I totally LOVE the whole bullet journey thing and whenever I look on Pinterest etc I feel a bit discouraged when I see all of these fancy schmancy bujo pages and mine looks like a wreck. I want mine to be pretty too… I love stationary stuff I’m like a kid in a candy store when I see stuff like that. So one night, thinking about how to make my bujo Pintrest worthy, it came to me. TRACING PAPER PEOPLE. THAT’S RIGHT. TRACING PAPER. I google images of what I’m after, trace it right off my tablet/phone screen and transfer it right into my journal. And BOO YAH. Lol tracing paper has literally transformed my thoughts and creativity on the whole pretty bujo thing. Now you guys can have my secret too! Tracing paper baby! This is brilliant! I’m so glad to see someone so like minded! I love the simplicity of your bullet journal approach…. however as a creative person I LOVE the idea of a beautiful and fancy bullet journal with drawings and fancy pens and quote art…. BUT I am also a raging perfectionist and tend to rip out more pages than I actually use. I need a planner that will work for my life and help me get organized, thats the general idea of a planner. Anyway just wanted to say I agree with you because it sounded like you had a bunch of previous nay-sayers. Love this post! I have also had to pair down my BuJo from many colors to two to one, from doodles and fancy borders to simple borders to the most minimal graphics. I wish I had what it takes and the time to do the pretty artistic thing. But for me it turns out to be more of a stress than help and gets left behind. Happy to see more Simple BoJu posts. I also need a cleaner layout so I can more easily focus in on what is most important me. I use a smaller page size so it is one list per page. The next day is another page. I do almost exactly this, but on a weekly basis. At first I was daunted by the decorating thing, so, I just didn’t. Then I wanted something prettier. What I ended up doing is combining my bullet & art journals. How much art in between my list pages varies. It’s different, but it works for me. Those Pinterest journals are not bullet journals. The original intent was to do something simple & easy. Drawing all those banners and doodles is not simple & easy. Very pretty and rock on to those who want to spend their time doing that. My notebook is super simple. I used Google calendar for date specific things, like the water bill is due on the 15th. I use a Google doc for the brain dump of things that might be big projects, long term projects, or “when I get around to it.” If I rewrote that thing every day, I would nothing else. I look at my Google calendar & doc every evening and figure out what needs to/will get done the next day. I keep the list reasonable so I don’t get overwhelmed. I write those tasks in my notebook. It is with great glee that I cross them off. If I get everything done and have more time, it’s easy to add in more tasks for the day. In the notebook, I also keep notes about the day. When I have that torturous phone call with the cable company, I write down who I spoke to, what they promised, etc. When they drop the ball and I call again, I can say, “On July 2, I spoke with Suzy at 11:53 am. She said……” That really makes them sit up and take notice. My notebook is not Pinterest worthy, but I get more done in day than a lot of people do in a week. I saw a Pinterest pin yesterday about “how you’re doing bullet journaling wrong”. How can it be “wrong”. You need it to work for you! I personally use 50¢ composition books. Mine is a cross between a journal, a planner and a bit of scrapbooking on days I’m in the mood and have time. Works for me! My advice is: make it yours. Period. The whole idea is to use what works for you… keep it simple or make it complex, decorate it or don’t… everyone is different and all the bullet journals should be different… That is what I like… I agree I tried many different kinds, bought pens etc…. What I came back to is very similar to yours… in a weekly planner format, and put on each day what I need to accomplish for that day…I have lists in the back, and a section for my menu planning/grocery shopping… has it worked yet? Not really… but it is a work in progress and still evolving… Good luck to everyone, may you find your path that works for you. Totally love this 😀 Back to basics! I’m happy to be validated!!! This is exactly what I do in my $1 “Jumbo Little Book” from the dollar store. I write a couple of extra things but quotes, books, anything I want to remember but nothing fancy BUT the focus of my journal is my daily to do list. I enjoyed your article. Very nice! I was getting overwhelmed starting a bullet journal. The original idea is helpful but I can’t take the time to make mine ‘amazing.’ I have my list and and few extra things to track and that’s it! Thanks! You are on the money with this post! I was intrigued with the idea of the bullet journal until I realized that it would take me hours to set up. I just don’t want to spend that much time on something only to mentally discard it every month. Thank you for sharing! I just discovered Bullet Journals a couple of months ago, and loved the idea. I quickly realized, though, that there was no way I’d maintain one! So I bought a notebook and started listing four things: the day’s activities, my to do list, my food log, and my expenses for the day. It’s been really easy to keep up this way! Hi Karen, I love that idea! So much better to focus on only tracking a few important things instead of absolutely everything. Thanks for the tip! I’ve always been a journaling girl. With a table of contents and everything my High School English teacher instilled into my very soul. However, I never knew where they were so I would start a new one. 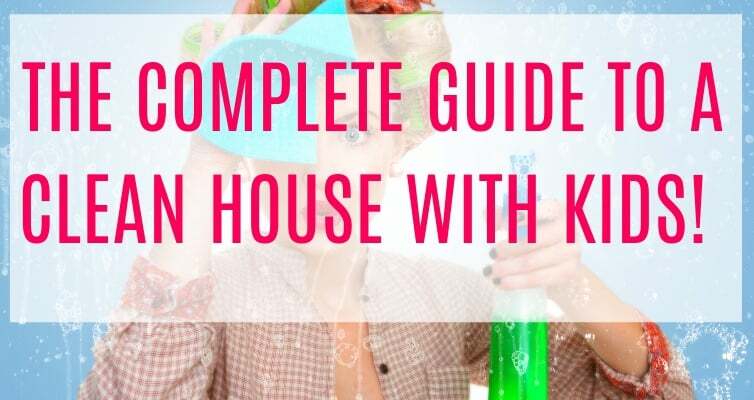 I now know what I’ve always needed is an education in home management, cleaning and organizational skills. So I’m working with a planner and I like the gratitude, inspirations, affirmations, self care and other wonderful things I found doing the bullet journal. I’m like you I’ve always kept a short list in small weekly calendar. But I need to be educated on organizing so I’m going for it. Will let you know. Good for you teaching children at home. I retired from teaching when they started making us teach a test and I believe children should be gently lead to Learn how to learn, and be life long learners. Have a wonderful weekend. I enjoy your blog. Thank you so much for your sweet comment. I’m truly thankful that you enjoy my blog. 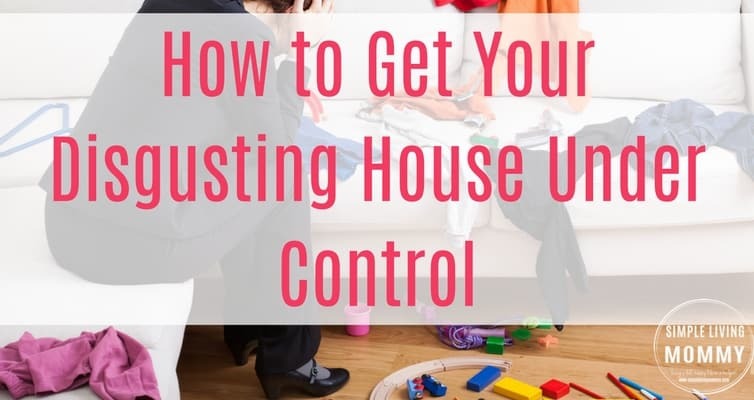 Good for you for finding something that works for you and for knowing yourself well enough to know that you need to learn how to manage your home. I’ve been in the same boat for the last few years and am getting there slowly but surely. My main tip is to create ROUTINES. That’s been the biggest change and life saver in my house. Good luck! I thought you were talking about me! I have been struggling with the same problem and finally did exactly what you did. I did two things differently, I do weekly pages instead of daily and I drew a rectangle the length of the page on the side and divided it into the days of the week where I put my appointments and deadlines. Then I list my to-do’s beside that. Everything else is the same as you. Thank you for this post, I thought I was the only one! This is just the old fashion Franklin planner system. I took the class years ago and that what were talk. I do my bullet journal that way too. The truly original bullet journal worked well for me while I was working—I preferred and still basically use the original symbols—but now that I’ve retired, I’m struggling to make it work. I just got my funnel-styled calendar for 2018 and plan to just hike-punch some card stock to help me with the journaling part. Definitely would never be faithful to all the crazy things people do with bjs today! Way too labor intensive and time consuming! I think your system sounds great for people whose main goal is to keep track of daily to-do lists. It’s so gratifying to find a system that really works for you! My bullet journal is closer to the original bullet journal system that you can find on bulletjournal.com, but I have a few collections too, and I like to be creative with it when I have time. I needed a system that could help me keep everything (as in basically my whole life, haha) organized in one place. It works really well for me. I make my own planner cause I wasn’t able to find one that fulfilled my needs. It is kind of a bullet journal but also more simple. Since I’m in college, I still need a paper planner so I can combine my classes, school work and personal life in one planner, and for me it works best if that’s on paper. It is a normal book with lines and I have some free pages at the front to write down phone numbers for appointments, a tracker to see my family… Then I leave a free page every month so I can write the to do’s that are not that urgent but I would like to do that month. And then I have al the dates like a regular planner (7days on 2 pages), but next to every date, I drew a line so I can list up the to do’s for that day (deadlines for school etc). And then at the end of the second page of that week, I have a little ‘notes’ box for to do’s that I have to spread over that week or things I have to remember or… so that’s my system! If you would like, I could send you some pictures! A thousand times yes! The point of a bullet journal is that it has to work for you; that gets lost in all the graphics, art work and ephemera. Same thing with scrapbooking; there’s so much happening one one page you can’t find the photo. My system is similar, but I use a two-page spread with days of the week on one side and the other side divided into notes and my to-do list. If something MUST be done on a certain day, I write it on that day. If it’s just needing to be done this week sometime, it goes on my to-do list. I use the notes section to record notes about phone calls etc that I may need to refer back to later. Simple but it works! Great advice! I too can’t be bothered / don’t have time for the artwork and calligraphy, beautiful as it is. Having spent a lifetime procrastinating, that’s what it feels like to me! I have kept a simple bullet journal (pocket diary sized with a black pen) for nearly 6 years. As others have said. it’s useful to consolidate lists or for bigger projects, vacations, etc. and gives a monthly overview. And what would we do without the digital reminders of birthdays etc.?! For daily use, I have a desk diary (searched high and low, and eventually found this in Muji). It has a week to view – days of the week on the left page and a blank sheet of squared paper (my favourite) on the right for notes and reminders, or doodles if you must! Similar to you, I can transfer tasks from one day to the next, as often happens. My daughter showed me her beautiful bullet journal this week, and explained that a lot of the art and checklists are kind of therapeutic – I get that, but it’s not for me! I do almost exactly the same thing. I love the idea of a pretty and elaborate bullet journal but it’s just not for me. It was too much work! I just started Bullet Journaling and I agree with you that many of the traditional spreads aren’t a good fit for my life. I too am more prone to simple styles and will keep yours in mind. I am also not super artistic so that may come later. I can tell each month I use the journal, i’ll Be able to tweak it a bit for the next month to be more useful and personalized to me. At 60 years old, I have been using a “bullet journal” for 30 years now so they are not new! I use a 5 x 7 spiral notebook because I can slip it in my pocketbook. I start the page with 5 planned meals based on the events coming up that week and what I have in the freezer – with two meals for eating out or last minute decisions. 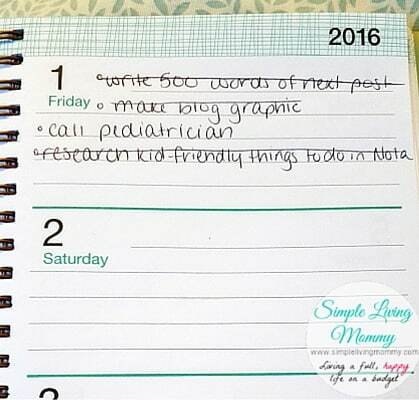 The bottom of the page is labeled Monday – Friday with reminders of appointments, tasks, phone calls kid’s schedule etc. I use the opposite page to list groceries needed and notes to self. In the back of the book I have list of favorite recipes, chores completed and organizing thoughts. Thank you for this post. I have started a bullet journal but have kept mine very simple. I have thought that everyone is way more concerned with making theirs share worthy and spending so much time on it, that it can’t be very productive. 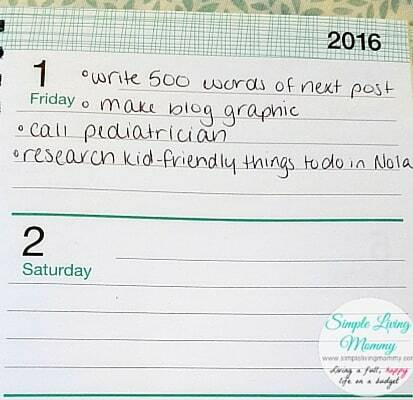 For me, it’s more about keeping a list so I can get things done. I have also used the migration to the next day instead of the month. Thanks for the confirmation that I am not ‘doing it wrong’.